Cannabis legalization: getting it right. As the date for cannabis legalization approaches, Canadian municipalities are taking a big step forward in their preparation to keep Canadians safe and well-served from day one. Following months of collaboration with a municipal technical advisory group and legal experts and in partnership with provincial-territorial municipal associations from across Canada including Municipalities Newfoundland and Labrador, the Federation of Canadian Municipalities (FCM) has launched the Municipal Guide to Cannabis Legalization. From business licensing to land use management to regulating public consumption, legalizing cannabis is expected to involve many municipal regulations. Developing the rules and capacity in advance of legalization remains a top priority for municipalities. The range of issues municipalities need to consider include everything from commercial cultivating and processing facilities to safe workplaces to public marketing. 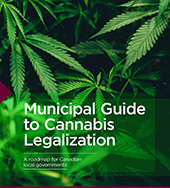 The Municipal Guide to Cannabis Legalization provides extensive municipal policy, regulatory and legal information and includes a collection of existing best practices. “The FCM’s Municipal Guide to Cannabis Legalization will be a key tool for communities getting ready for cannabis legalization. This Guide not only describes the tremendous scope of work ahead for municipalities, but it also offers some direction and options on how to implement that work,” added Gerbasi. More information about the Municipal Guide to Cannabis Legalization and FCM’s work on cannabis legalization can be found here. The Federation of Canadian Municipalities is the national voice of municipal governments, with nearly 2,000 members representing more than 90 per cent of the Canadian population.